The hardest thing in life is to walk a mile in someone elses shoes - but it is also the most worthwhile. Try it. CORROLARY: don't be late, it says: "I didn't care enough to plan to be on time"
Make sure that your expectations are realistic. Truly realistic. 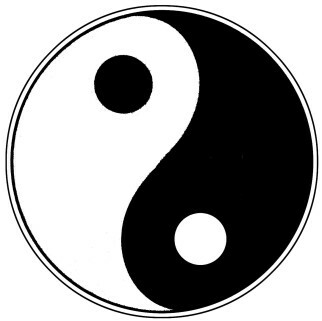 Recognize the balance in the relationship - The chinese image of the TAO; yang & yin, light and dark - two halves make one whole: the more you take of the space, the less it leaves for the other. Maybe I'll update this list, I'm sure I missed a TON. How about "always express appreciation to the other person when THEY go out of their way to do something nice for you (even if it wasn't beneficial)"? * Let some things slide, even if they are wrong - choose your battles. Great list Jon. I strive for your wisdom. Wow, sorry it took me so long to comment on everyones great thoughts here... I had to run to the store and pick up some more plastic wrap... DOH! Seriously, no wonder I like each of you so much, these are great thoughts. Mike: yeah, when someone does something nice, it is far too easy to just accept it without expressing appreciation. I try to always thank people for even the smallest thing. Aleah: plastic wrap, huh? Sweet! We'll have to chat offline about that one... LOL!! Seriously, I like all three but the one that is probably most commonly overlooked by most people is that being alone thing - I think some people can't handle it: they always need to be with someone else. Fouro: sage advice, and not just for kids. Everything should be secondary to the bond between the two. Chuck: thank you! Not sure where the hand/voice one came from, but glad you liked it... and I don't know that you have much striving to do, most times I'm struggling to keep up with you! Thank you all for the great comments - seriously!! Hey Mike - Merry Christmas! Not booze, Chuck. This saran wrap's hell to type through. I'm late on commenting as well, but thank you and great job! - Don't try to fix the problem before you listen with both ears and your heart. The person talking to you might only want you to listen. Todd, yeah, that is a great advice!! Sometimes just being there is all that matters.